A 5-day cultural programme and exhibition – ‘Octave 2019’ began at Jawahar Kala Kendra (JKK) on Tuesday. The 5-day festival brings together a plethora of arts and crafts from the North Eastern states of India. The programme was inaugurated by the Principal Secretary to the Government, Tourism, Art, Culture and Literature, Ms. Shreya Guha along with author and former beurocrat, Meenakshi Hooja. The Additional Director General (ADG), JKK, Mr. Furqan Khan, Director, North Zone Cultural Center (NZCC), Patiala, Mr. Saubhagya Vardhan, Programme Officers, North Zone Cultural Centre, Patiala, Mr. Jarnail Singh and Mr. Rajesh Bassi were also present on the occasion. Mr. Furqan Khan in his introductory speech welcomed the artistes and shared that events like ‘Octave’ majorly contribute in promoting the rich cultural heritage of our country. It will also go a long way in enabling the union of diverse cultures. He further remarked upon the decor of the festival stating that the aim is to immerse the visitors in North Eastern India. The programme then opened with a dance performance of Bardoi Shikhla from Assam usually performed at the onset of Spring. 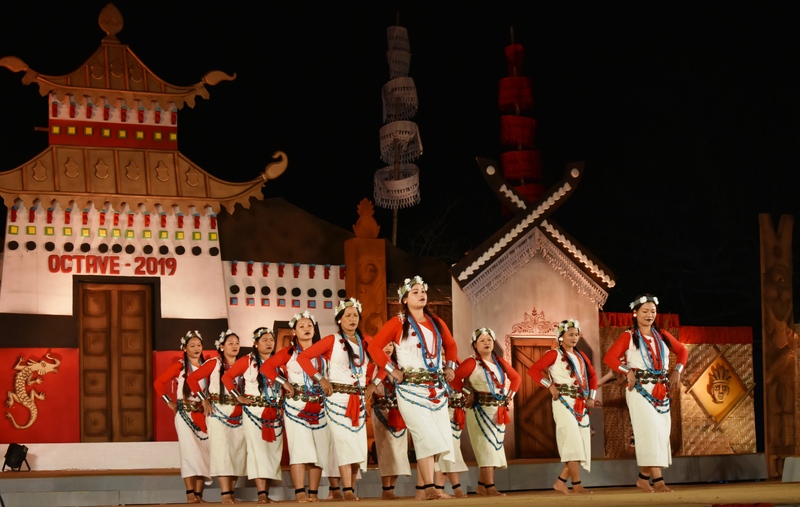 This was followed by other cultural performances like – Rikam Pada (Arunachal Pradesh), Chirol Jagoi (Manipur), Cherao (Mizoram), Manipur Raas (Manipur) and Bhortaal (Assam) Khupelali (Nagaland), Tamang Shello (Sikkim), Sangraai Mog (Tripura), Thangta, Pung Cholam and Dhol Cholum (Manipur) and Bihu (Assam). During the performances the audience was also briefed about the various legends behind the dances. The evening then witnessed a grand finale in which all cultural performances came together to portray a spectacular panorama of North Eastern culture. It is to be noted that a combination of these performances will be held on all 5 days of the festival from 7 pm onwards. Another attraction of the event is the handicrafts exhibition of North East in which around 30 stalls by 60 artisans have been set up in which handicrafts including dry flowers, decorative and daily use jute products, bamboo and can items and artificial jewellery are on display as well as sale. It will remain open daily for the duration of the festival from 3 pm onwards. It is to be recalled that the programme is being organized jointly by JKK and the North Zone Cultural Center, Patiala.